The Basics: Do Wine Glasses Matter? The perfect basic glass shape. 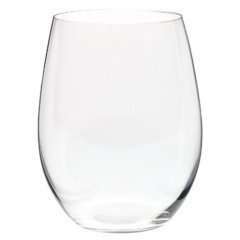 It has the right shape: There are two critical components to the shape of a table wine glass. First, it has to be BIG; dainty glasses that you fill to the brim need not apply. Second, it should be round and bowl-shaped at the bottom and tapered at the top. Why does size matter? Because in order to be able to fully understand a wine, you have to get a clear sense of what it smells like, and in order to do that, you have to swirl it around in your glass. This isn’t just a pretentious ritual (although I did feel horribly self-conscious doing it for months): when you swirl a wine, it volatizes the aroma compounds in the liquid and causes some of them to vaporize and travel up out of the glass. If you put your nose right in the glass and sniff right after swirling, those vaporized molecules end up in your nasal passages, which are the most sophisticated flavour detectors we humans have at our disposal. The taste buds can detect five distinct flavour notes (sweet, sour, salty, bitter, and savoury/umami); our olfactory areas clock in at around 10,000. There is no question you get a lot more out of a wine when you swirl and sniff…but in order to do so, you need a wine glass big enough that when you swirl you don’t create a wine tornado that ends up on everyone else at the table. The solution: buy a bigger wine glass and never fill it more than half full. If that glass is larger at the bottom and narrower at the top, there will be plenty of surface area in the bottom of the glass for the aroma molecules to vaporize, but they will all be funneled towards a smaller opening at the top of the glass, which will concentrate them for your discerning nose. The glass to the right is an example of what a good wine glass is shaped like. 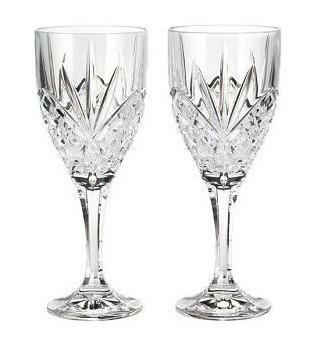 It’s thin and clear: Your aunt’s lead crystal, multi-faceted, prismatic wine glasses are probably very expensive, but they’re not conducive to learning about or appreciating wine. Apart from the smell component of a wine (discussed above) and the taste component (which is, I hope, obvious), there is also the sight component of wine: you can learn a ton about a wine by what it looks like. For example, red wines are purpler when younger and turn brick/orange at the edges of the glass when they get more aged; white wines are the opposite and start paler, almost green-tinged, and get more yellow/gold as they age. If a red wine has high pigmentation (lots of colour compounds that prevent you from seeing through it), it probably comes from a thick-skinned grape varietal like Cabernet Sauvignon; if it has low pigmentation (if the colour is thinner and you can see through it), it probably comes from a thinner-skinned varietal like Pinot Noir. Sight perception provides a surprising amount of info about a wine, info that is completely blocked if all you can see in your glass is insect-eye patterns of Waterford crystal. Transparency is key, and anything that impedes it, including graphics, coloured/tinted glass, and patterns, is a no go. 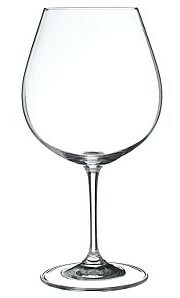 It has a stem: I may get in trouble with some wine glass makers here, because even Riedel has a series of wine tumblers. But I have already gone on at length about the importance of serving wine at a proper temperature and making sure your wines don’t get too warm…well, guess what warms up a glass of wine more quickly than anything else? Body heat! If your hand is cupped around your glass at the bottom of the bowl where the wine is sitting, your wine will inevitably get quite warm quite fast. That’s the main function of the stem of a wine glass: it’s the part of the glass you hold onto when drinking so as not to pass the heat of your hand into your wine. While wine tumblers may look cool, I think they take away from what’s served in them, which is THE biggest faux pas a wine glass can make. The overall point of any wine glass is to make whatever bottle you’re drinking, no matter what it is, show as well as it can. If you, like me, can’t afford to stock multiple collections of glasses to match whatever you’re pouring, stick to the 3 rules above and your glass won’t get in the way of your wine. The Mediterranean in me has to come to the defense of the wine tumbler. Both my Greek family and my Italian in-laws use tumblers as casual wine glasses at home. This is how table wine is consumed in the countries they emigrated from – you see it in restaurants all the time. So, I think “trendy” is a misnomer for describing this type of glass – in some cultures wine is consumed at all times of day and this is a practical glass to drink it from – with your salad, while taking a break from work in the middle of the day. While you drink, the glass rests on the table in the shade (so your hand isn’t there warming the wine up). Being nostalgic for the way my parents drink wine, I picked up a set of these Riedel tumblers and use them to drink wine while working on the computer. If friends come over for dinner or we have a party, I bring out the stemmed glassware. Bonus: I once dropped one while washing dishes and it bounced off the floor without breaking! This web site is my aspiration , really great pattern and perfect articles . I think all 3 types of glasses are valid, otherwise they would’nt survive on the market. I personally love crystal, where in lack of ‘sight component’ was specified as a negative thing, but wine should rest/breathe in a decanter (in whitch you can observe it) before drinking therefore the negative remark stands invalid. I think that’s being a little to kind to market knowledge and intelligence – the fact that something sells does not mean that it’s best suited for its function. If your personal preference is for carved crystal, then you should by all means indulge it, but my point is just that it does detract from a fulsome analysis of a wine. It’s not as easy to observe wine in a decanter (you can tilt the glass to see if a wine’s colour thins out or changes at the rim) and many wines don’t need decanting in any event. Thanks for reading and commenting!